12 goals from 33 matches for club Wolfsburg in the 2012-13 season and just 5 from 15 appearances in the 2013-14 season. Nothing home to write about of such figures. 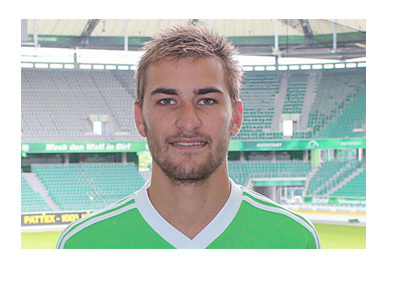 Even the name of scorer, Bas Dost, was not exactly a good sounding one. For someone who was on-and-off in the starting eleven last season, 2015 has been one of sheer sensation. The name Bas Dost is now a fodder for fantasies rarely witnessed on the European football scene. From 19 games for Wolfsburg in the current 2014-15 season, this 25-year footballer from Deventer, Netherlands, has banged in as many as 16 goals and an incredibly, 13 of those have come in the last 8 games. In fact, this season itself had started badly for the Dutchman with a goal drought staring at him till almost Christmas. Hamburg showed interest in the striker but Wolfsburg manager Dieter Hecking put his foot down and instead sent away Ivica Olic. With Olic out of the way, Dost found himself teamed up with Nicklas Bendtner as the second and supporting striker. His goal hunt couldn't have started more sensationally. On January 30th, his brace helped his club register one of the most memorable wins in their history - the demolition of German and European giants, Bayern Munich 4-1 at BayArena. So much so, that Arjen Robben was prompted to say that he wanted to play alongside Dost for Netherlands. The rich vein of Dost's form continued with him scoring twice in successive matches against Sporting Lisbon, Hertha Berlin and Werder Bremen. In his club's thrilling comeback win of 5-3 against Bremen he took his tally to 13 goals from eight games, just a shade less than what Messi has scored since the beginning of 2015 - the Argentine has 14 from 13 games. What makes Dost's plunder more remarkable is that the Bundesliga started late in January 30 coming out of its winter break. The €7 million 2012 signing from Heerenveen has eclipsed Andre Schurrle's 22-million pound transfer from Chelsea and for a player whom the Germans had hardly noticed for the past few years, titles like "Dost-Busters" and "The Wizard of Dost" seemed to have popped up regularly of late. For critics, Dost is just another striker from the old-school style of football. He lurks in the box and poaches for scoring opportunities and when he scores he lacks flair, they go on to say. Add to that is the hipster-like salute with chin pointed skyward that lends sheen to what are not very extraordinary goals, they feel. It's not very untrue that Kevin De Bruyne's brilliance had a hand in many of Dost's goals. But goals are what matters for any side and Dost just can't stop scoring them for Wolfsburg. Barring the time when they were runners up in 1998-99 and Bundesliga title holders in 2008-09, Wolfsburg have never come so close to the top. Although 8 points behind Bundesliga leaders, Bayern Munich, Wolfsburg have virtually assured themselves of a second position in the Bundesliga and consequently a spot in the next years UEFA Champions League. They have just one man who has admittedly surprised even himself with his phenomenal run of form, to thank.